With health and safety in every workplace - why not be first on the contingency plan with a batch of sound Company First Aid Kits at the customers' access when the next accident occurs? Customise with your Company brand-name and logo, Personalise, Prepare and Promote these great corporate gifts to customers for their different allocated areas of use. 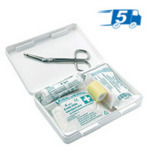 They'll be used in many different work place areas, and can easily be stored in a car glove compartment, office or kitchen drawer etc, and contains scissors, bandages, plasters and much much more for any minor cut, scuff, burn or bruising at the home or workplace. Hand out a batch of Company First Aid Kits and be first on the response with a caring safety gift! For a FREE QUOTE, please fill in the form regarding our Company First Aid Kits and we'll be able to help you.